We had a family trip to NYC over the weekend to see the play Wicked so boatwork was not an option this past weekend, but before we left I spent a little time rough cleaning the stern lamination and knees I had glued up the night before to see how it turned out. Everything looked pretty good and there were no huge messes to take care of; it was just a simple matter of hitting everything with the sander to get rid of the squeeze out. I left for the weekend in good spirits. Fast forward to last night; I enlisted the whole family to come over to the shop to flip the boat. In retrospect I should have brought some beer and celebrated a bit, but logistics have never been my strong suit, so we just got on with it. 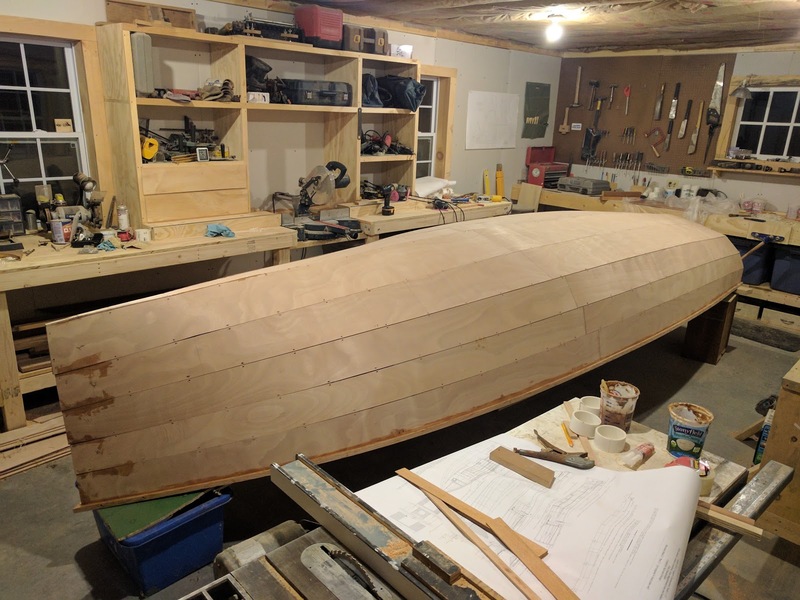 With the knees, outwales, and three frames in place the boat has gotten surprisingly rigid, but it's still very light. I'm not sure exactly, but I'd say it's still under 100 pounds, so the flip was uneventful and I had no opportunity to teach my kids salty phrases. 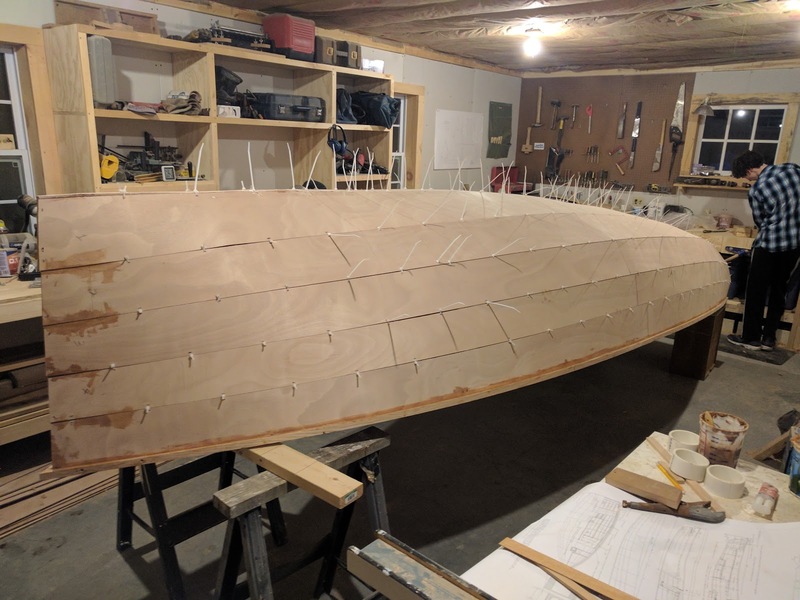 We set it up on blocks and I made sure the hull remained true during the flipping process and then went to town clipping off the 300 zip ties. The novelty quickly wore off because many of them were partially glued in place when I tabbed the inside, so there were very few that came out easily. Most I had to clip off flush on the hull and then from the inside (on my back), I would yank them out or break them off with a pair of pliers. It took far too long and I was really glad when it was done. I did find an annoying mistake while removing the zip ties. The cradle I used to keep the boat upright had caused a slight depression on the bottom of the hull. It was only about 3-4 mm over a 2 foot section on the keel strake, but it was definitely noticeable from the right angle. Unfortunately, the tabbed in frames made it difficult to remove entirely. 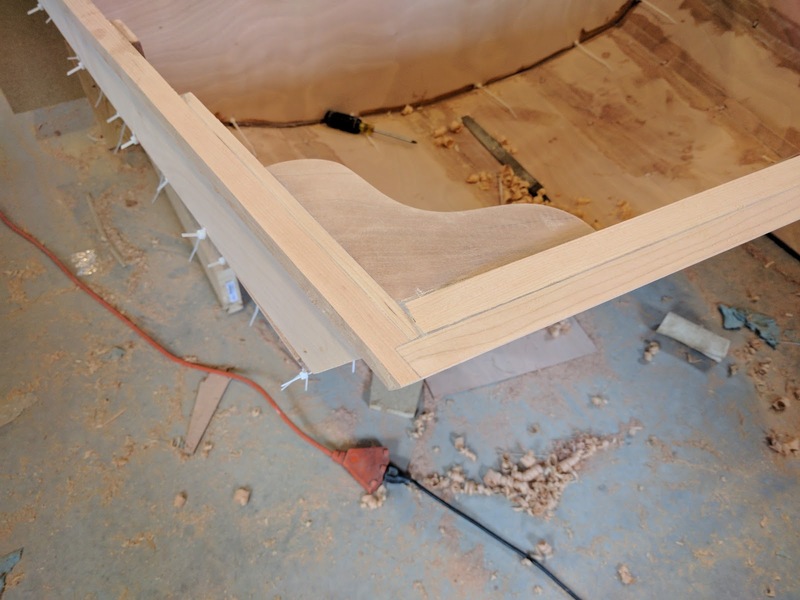 I reduced it as much as I could by propping up the center underneath frame 5, but there is still about a 2mm deflection along the keel strake. I decided that I would correct it with the miracle of epoxy and came to terms with it pretty quickly. The epoxy won't add much weight, and will make the hull fair. It is not noticeable inside the boat. After work today, I got right to work with the low angle block plane to get rid of any anomalies between any joints in the strakes. Other that the low spot on the keel strake everything looked great. I was able to take care of everything in about 30 minutes. Then I sanded all the joints with 80 grit and mixed up the first of many small batches of thickened epoxy. 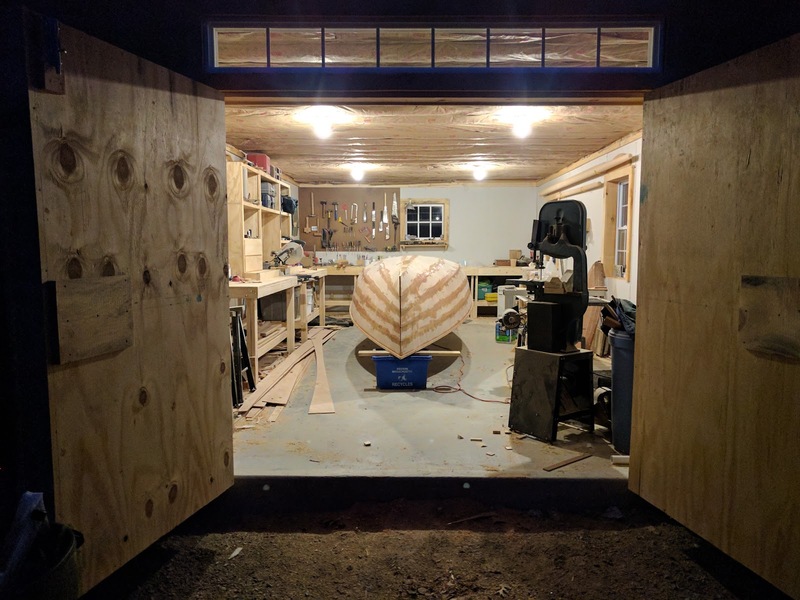 Since this portion of the build is not structural (that comes later when glass tape and sheathing is applied to the outside), I used a 50-50 mixture of wood flour and glass spheres to make the fairing a bit easier. 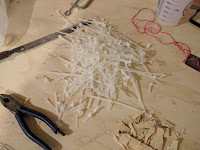 I started by spreading out a reasonably thick course over the deflected area and then moved on to filling all the seams and holes left from the zip ties. 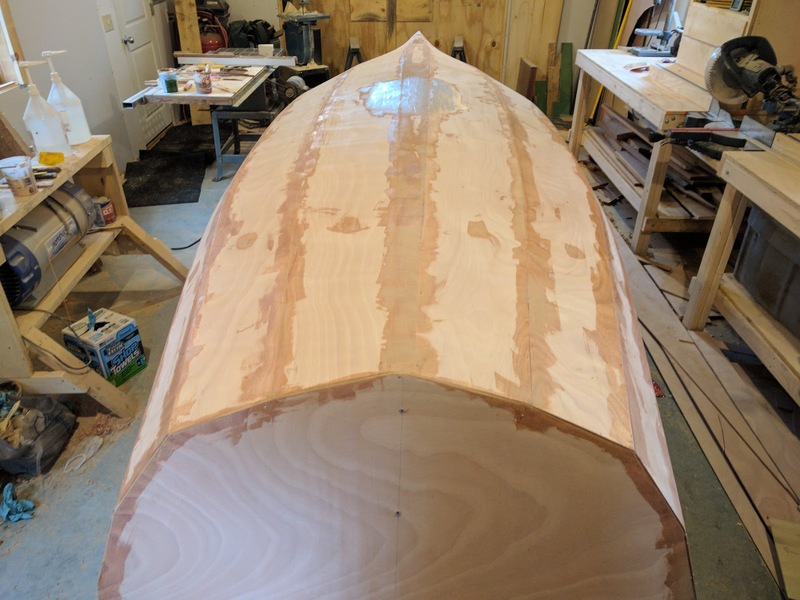 I also spent some time filling in the partially lapped strakes at the bow. All told it took about 2 hours. Tomorrow I'll sand it down and find what I missed and do it all over again (but hopefully not as much). It's finally warm again and I can open things up a bit.